Windsor’s Drycleaning Centre is a full service cleaner that combines quality cleaning and excellent customer service. 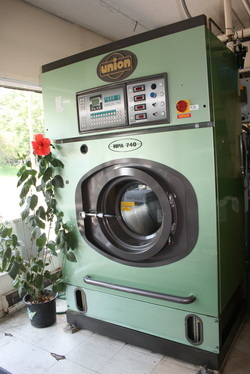 The Drycleaning Plant operates Monday – Friday at the Parkhill Rd. Location across from Jackson Park. Shirt Laundry and Drycleaning can be performed on a Same Day Service basis for all locations in Peterborough. Pick Up and Delivery is also available throughout the work week. Our speedy delivery van can pick up your cleaning and return it usually within 2 business days. Winter Coat cleaning is our specialty! Watch for discount coupons and sales each Spring and Fall. Household Items such as comforters, duvets, sleeping bags and quilts can be cleaned within 2 business days. Watch for sales and Coupons during the Spring and Summer months. Alterations and Repairs, such as small mending repairs, replacing zippers and hemming garments can be performed by our expert tailor on an as need basis. We offer Linen Rentals and have a large variety of tablecloths, overlays and napkins for that special occasion. Contact our Parkhill Store for colours and sizes.